ST. GEORGE, Utah – Hose Candy™ received two Specialty Equipment Market Association (SEMA) Global Media Awards during the 2011 SEMA Show for their new Barb Bite™ hose retainer kits and Hose Skins™, which slide over stock or custom hoses to create the ultimate custom look. “This is the fourth Global Media Award for our company in three years, and we are honored that the global automotive community continues to recognize our high-quality products designed to improve the look and performance of under hood engine compartments,” said CEO and founder Jon Petty. Barb Bites are two-piece, snap-together hose retainer systems that provide a secure, leak-proof connection for flexible hose and barbed fittings. They feature a patented compression collet and sleeve that provides a 360-degree radial crimp and can be pressed together with standard adjustable pliers. Available in black and blue, Barb Bites offer an alternative solution to inconsistent, leak-prone cable ties, Oetiker clamps, snapper clamps and metal clamps under the hood. The easy-to-assemble Barb Bites provide a permanent connection and are designed for 1/4-inch to 3/4-inch i.d. hose sizes. Barb Bites are rated for under hood temperatures of 300 degrees Fahrenheit as well as for air, oil, alcohol, gasoline and other industrial chemicals. Additional applications include turbo hoses, waste gate, boost controllers, boost and vacuum gauges, rubber fuel lines, heater hoses, brake booster hoses, and Y and T fittings. Hose Candy Hose Skins provide custom styling and enhanced performance under the hood by sliding over existing hoses. The new Carbon Fiber and Kevlar Hose Skins feature a proprietary weave and coating system called SkinPosite™, which allows DIYers to effectively install these high-tech fibers over hoses in their shop or garage. SkinPosite technology solves several problems when working with high-tech fibers, including making them quick and simple to install; keeping the fiber pattern properly aligned; conforming to tight bends without bunching; and preventing the fibers from getting a “fuzzy” look or catching on sharp objects. Hose Skins can be ordered in straight carbon fiber black, Kevlar yellow, or carbon/Kevlar hybrid in custom colors like black/yellow, black/orange, black/blue, black/red, black/green and more. The Hose Skins offer lightweight protection to help provide bullet-proof hoses while looking great. Hose Candy received its Global Media Awards from a voting panel of 25 journalists from leading consumer and trade publications representing 13 countries. 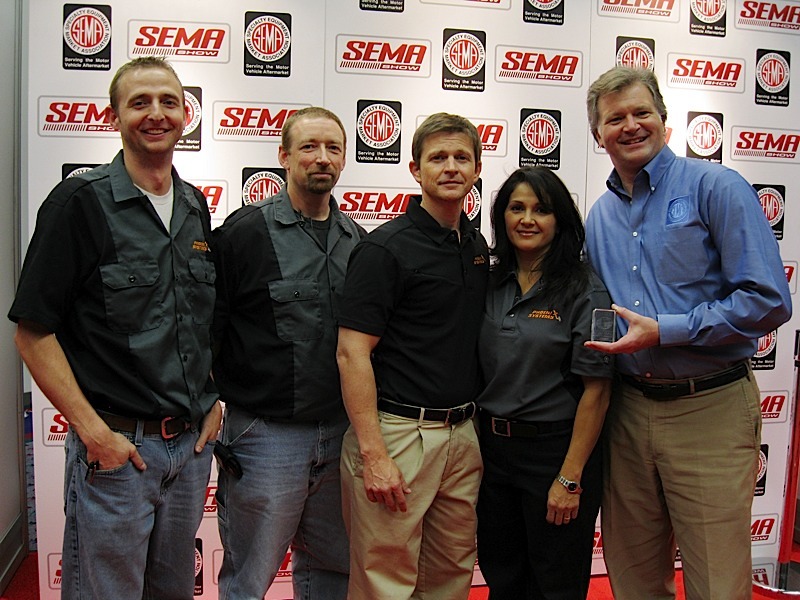 SEMA introduced the Global Media Award program in 2004 to highlight the wide appeal to enthusiasts on every continent of specialty-equipment products that are on display at the SEMA Show. Oomph! Labs, developers of the Hose Candy product line, is dedicated to providing hose solutions that help anyone build their own custom, bullet-proof hoses that transform the look and performance of vehicles. For more information, write to 4012 S. River Rd. Ste. 4B, St. George, UT 84790; call 435.673.0777; or visit www.hosecandy.com. 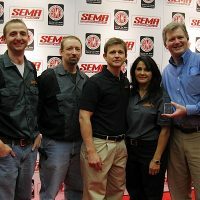 Photo Caption: (L to R) Hose Candy’s Ben Martinsen, Cal Clark, Jon Petty and Nichole Petty accept their Global Media Award from SEMA Senior VP of Operations Bill Miller.